South Adelaide's senior women will play for premiership points on the same day as their League counterparts for the first time during the Club's annual Good Friday showdown with Glenelg. The Panthers and Tigers will put on a Good Friday triple header for the fans at Hickinbotham Oval, with the SANFL Statewide Super Women's League teams playing off in the final match of the day from 3:55pm - see the League and Reserves team selections here! Coming off of a convincing 86-point victory over Sturt, South will be boosted by the return of several key players not passed fit to tackle the Double Blues. Mobile tall Mollie Mckendrick makes a welcome return to the team after missing the past two games due to basketball commitments. Meanwhile, experienced heads Lauren Buchanan and Stacey Huddleston are set to sure up the Panthers backline and young speedster Hannah Munyard also returns to the side. Young forward Taylah Eastwood could add a second SANFLW game to her resume after being named on an extended bench that also features potential debutant Grace Duffy. Unfortunately, classy defender Caitlin Williams (leg), young ruck Montana McKinnon (finger) and forwards Elisabeth Davison (shoulder) and Bronwen Bosley (hand) have been squeezed out of the side due to injury, thankfully none are deemed as serious. 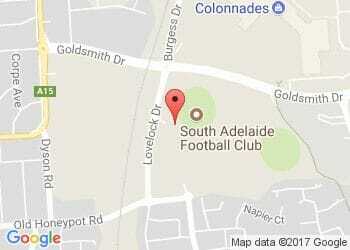 Earlier in the day, South Adelaide's League (1:10pm) and Reserves (10:30am) sides will also be in action. Check out the map below to ensure you get the best park in the house tomorrow! Get on board and help us be #StrongerTogether in 2018!